UP Board Registration Last Date 2019 in 9th and 11th Class who will give exam in year 2018. UP Madhyamik Shiksha Given the deadline of last date to all school who are filling their college seats whether in Private or Regular by creating form of UP Board 1st Year. It is very needed for applicant who will attend exam in year 2018,this year new rule come to connect adhaar card in form number. 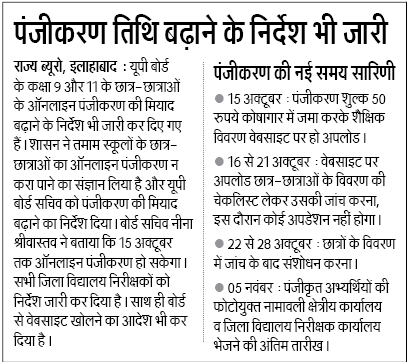 UP Board 2019 Exam Registration Last Date: UP Board has extended registration up to 15 October and released the Scheduled time table of 2019 exam. Applicant who want to attend 2019 10TH 12TH exam, they need to for registration form before 15 October 2019. UP Board Latest News 25 August 2019, No Adhaar Card is mandatory in admission of 9th and 11th Class. If you dont have adhaar card and waitng to get by Indian Post office delivery than up board basic education sachiv Nina Shrivastav said to relaxation on their. 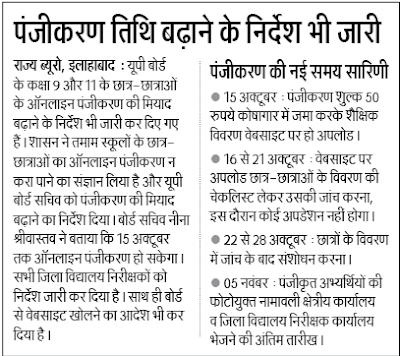 UP Board Direct Registration 2019 is now Stopped : On 8 September UP Board has stopped registration for 9th, 11th class in those school where 100 seats are filled. If any school wants to take more than 100 students, they are give to fill form of challan from DIOS. UP Board 9th 11th Registration Form 2018: You can upload your form on behalf of registration in 9th 11th at website upmsp.edu.in. By submitting this form you are eligible to attend written exam held in month of March and able to check result, receive marksheet from up Madhyamik shiksha board.